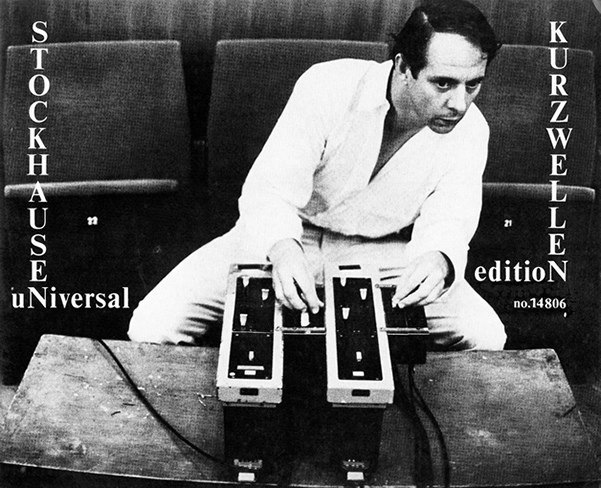 Analysis, explanation and personal impressions of the works of the avant-garde composer Karlheinz Stockhausen. KURZWELLEN is a direct evolutionary step forward from PROZESSION. The concept of using "plus-minus" notation (+/-/=) to indicate the type of variation to be used from event to event started in the earlier work, but instead of sampling from a sound pool of Stockhausen's own works, here KURZWELLEN adds the "x-factor" of giving each performer a shortwave radio to use as a secondary instrument and sampling source. In other words, the performers search for desirable sounds on the radio (usually abstract, "noisy" sounds) and then replicate them on their instruments with variations in register, volume, duration or rhythmic density ("segmentation"). Additionally, KURZWELLEN has instructions for players to form synchronous duo, trio and quartet events, where players play together in tandem, or alternatively trade short events with one another. PROZESSION had loose recommendations for ad-libbed group interaction like this, but KURZWELLEN specifically sets them in the score. into being or from where, and in which all possible acoustic phenomena can appear. It might be worthwhile to examine how shortwave radio works and how it sounds in order to make it easier to follow the development of the piece and distinguish the radio sounds from the performers' instrumental contributions. Shortwave is able to receive long-distance broadcasts from around the globe because it's wavelength can bounce off the atmosphere ionosphere (and go around the curve of the Earth). Some frequencies work better at night, and some work better during the daytime. Additionally, unlike the Internet, it is impossible for a government to censor content. Some of the content available on shortwave radio includes amateur radio stations, utility stations (weather, sea conditions, military, news), number stations (a voice reading out numbers), private 2-way communications, and general audience stations such as Radio Taiwan, Voice of America, Radio France Internationale, BBC World Service, etc... But most importantly: "shortwave transmissions often have bursts of distortion, and "hollow" sounding loss of clarity at certain aural frequencies, altering the harmonics of natural sound and creating at times a strange "spacey" quality due to echoes and phase distortion." (Wikipedia). The score is in 5 individual parts, 2 pages for each instrument (piano, tam-tam, viola and electronium, as well as a combined score for the sound mixer. The electronium is a kind of accordian-synthesizer, which is often used with reverb and volume effects. The possibilities for tam-tam and microphone were explored by Stockhausen's group of performers in MIKROPHONIE I. The parts for KURZWELLEN are written as symbolic instructions for creating 128 "events", but the initial event is usually a shortwave radio transmission. The players are instructed to avoid unmodulated ("clear") speech or music while looking for a desirable transmission. Each player can start at any time by quietly searching stations until a desirable one is found. The player's next event is to assume that sound in rhythm, timbre, "melodic contour" and envelope (changes in volume). The radio events are very rarely quoted verbatim. In fact many times the speech/music element of the radio transmission is ignored and the player only replicates the "noise" elements. Longer or shorter duration refers to the length of an event. Changing the "segmentation" is basically changing the number of notes in a phrase without changing the melodic shape, typically by dividing long tones into several shorter ones or playing tremolos. Each symbol is applied to one parameter. When there are multiple (stacked) symbols, they are applied to different parameters. A "+" and a "-" stacked in the same event could even be applied simultaneously to the same parameter by alternating or otherwise mixing the two values. All symbols can be reassigned to different parameters for each event unless the score has a box or bracket around/next to a symbol sequence, in which case that symbol row is to be applied to the same parameter. Any parameters which have not been chosen for transformation remain the same. A player can also choose to abandon his own event and instead use his next symbol on another person's current event (after that event has finished). He mirrors that event just as he would a radio event. In fact, a player's very first event could be either a free radio event or a variation of another person's event. Each player also separates his events with silences of various lengths. Droning seems to be encouraged since Stockhausen asks that each player must play a VERY long event (> 1 min.) at least once during a performance (this long event should be during a "+" event, followed by a shorter "-" event). A player can use his shortwave radio (with or without his main instrument) at any time in an event. In this case, the parameters of segmentation and dynamic can be controlled by working the volume or tuning knob rhythmically or otherwise. Other elements such as rhythm, melodic shape, etc... do not have to be as closely followed as when using a main instrument (this rule actually results in some players playing long stretches of just radio noise, after which they switch back to their instrument). A player should balance instrumental events with radio events evenly. The above instructions are more or less similar to those in PROZESSION, but KURZWELLEN also has a few additional symbols to trigger non-spontaneous group formations (duos, trios, quartets). For the top set of 3 "synchronous-signs", a leader signals a player (or players) to rhythmically follow him (additional elements such as timbre, melody, etc.. are often emulated as well). This group follows the leader in the number of events specified after the arrow symbol, while applying their own plus-minus symbols. For the bottom set of 3 "alternating-signs", players take turns (in a repeating sequence) playing their events for the number specified, usually as "echoes" of the leader. After the number of synchronous or alternating events required have been played, the leader signals the group's dissipation with a shortwave radio event. When a player reaches a "W in a box", he must repeat that event (applying the event symbol each time) until all players have arrived at the same place, after which a group event occurs. This keeps the ensemble more or less "on the same page". The last symbol of the work for each player is treated as if there were a boxed W above it (holding an event until everybody catches up). The score mentions at the very end that other "corresponding instruments" can also be used to play KURZWELLEN (but the tam-tam would be "difficult to replace"). Rolf Gehlhaar : "broadest spaces, surfaces, sustained bases, long durations"
Alfred Alings : "best translator"
Johannes Fritsch : "best transformer and dreamer"
Harald Boje : "best dynamic force, irritant, stirrer"
Aloys Kontarsky : "motor, battery, energy outlet, and "brain" (coordination, construction, technique)"
More of Stockhausen's comments on the "intuitive nature" of these kinds of works can be found on the page for AUS DEN SIEBEN TAGEN. What follows is my rough attempt to analyze the KURZWELLEN performance on Stockhausen Edition 13 from 1969 based on the group interactions. Because of the aleatory nature of the work, there's no guarantee that this is correct (or even very close), but it may be interesting as a kind of listening companion. Some synchronous group events were nowhere to be found on main instruments, so I assumed they were at least partially expressed with shortwave events. 23 33:20 Tam-tam trades w 1 other (V) 5 high gliss. decisively new in musical interpretation in general. 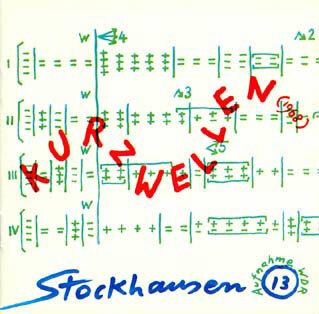 KURZWELLEN was first released on a double LP with 2 performances, one from Bremen in 1968 (released on the Stockhausen Edition 61 CD), and a later one from 1969 in Cologne (Stockhausen Edition 13). The interesting thing here (that Stockhausen mentions in the liner notes) is that early on in both performances the ensemble tuned in a 4-note timpani motive on the shortwave radio (somewhat like Beethoven's 5th Symphony "fate" motif), though the performers developed this motif differently on each performance. 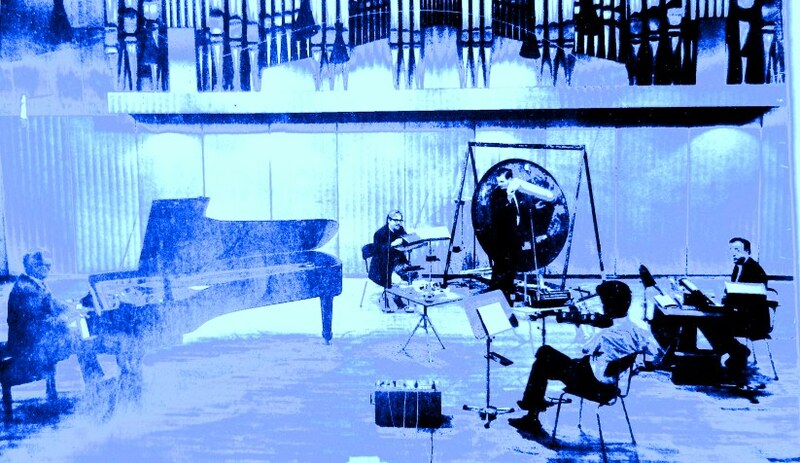 The ensembles for both performances were the same as for the 1967 recording of PROZESSION: Aloys Kontarsky (piano & SW radio), Harald Bojé (electronium & SW), Johannes Fritsch (viola with contact mike & SW), and Fred (Alfred) Alings with Rolf Gehlhaar (tam-tam, microphone & SW), Stockhausen on sound mix, filters and spatial distribution. 1970 was Beethoven's 200th birthday, and Stockhausen (among many other contemporary composers) was asked to contribute something to the celebration. Instead of giving a lecture of some kind, he instead decided to have his touring group, "Gruppe Stockhausen", give a concert. They performed KURZWELLEN, but instead of using shortwave radios as the secondary generators, he created tape collages of Beethoven recordings, modified with ring modulation, reverb, low-pass filters and other electronic effects. 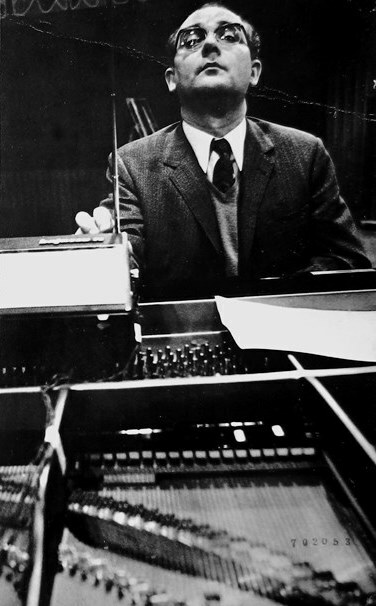 In order to obtain speech textures, Stockhausen also included recordings of himself reciting Beethoven's "Heiligenstadt Testament" (a long letter written by Beethoven - never sent - describing the depression and isolation he felt from losing his hearing) and subjected this to the same kinds of electronic treatments. Each player received 1 of 4 different tape collages and could tune them in as if they came from a Beethoven "radio station from space." This version is pretty interesting because there's no "noise" (radio interference) present on the tapes, so Stockhausen's players had no choice but to approximate actual melodic material. However, it's still only a few times that more than a few of Beethoven's scored notes are quoted. Most of the time the players are able to take brief motifs and transmogrify them into unidentifiable abstraction. However some well-known Beethoven figures do surface, most notably quotes from Piano Sonata 8 ("Pathetique"), Piano Sonata 23 ("Appassionata"), the Triple Concerto and the 9th Symphony's 4th movement ("Ode to Joy"). The performers are the same as for the previous performances. of intuitive inspiration) is becoming a reality. Despite Stockhausen's perhaps somewhat mystical claims of KURZWELLEN's virtues, it's a pretty difficult work to follow and enjoy for most people unfamiliar with abstract sound textures. Multiple challenges exist, such as the nowadays rarely-heard shortwave radio noises as well as the rarely-used electronium and tam-tam. In works which rely heavily on performer choice such as this one, I personally like to hear the interactions of the individual personalities, and it took multiple listenings to unravel the layers present on these recordings. It's definitely recommended to become familiar with PROZESSION and MIKROPHONIE I beforehand, to get to know the instrumental sounds. Playing around with a shortwave radio yourself is also very illuminating. On the other hand, it is possible to just enjoy KURZWELLEN as a portrait of the cosmic ether, with 6 "astro-audio-nauts" journeying through unknown soundscapes. Even after listening to KURZWELLEN off and on for over 20 years, I'm still able to "tune in on" new things on every listen. 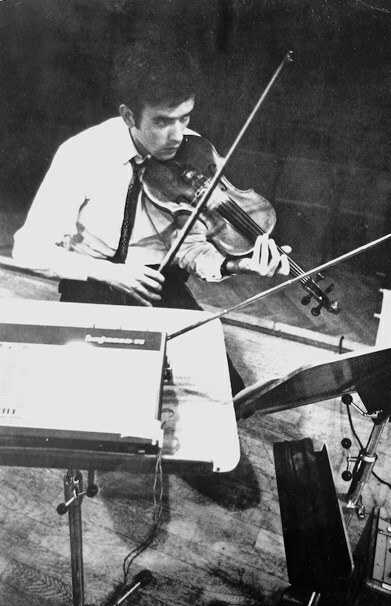 This is the first piece in Stockhausen's compositional body to use radio as an element. John Cage had used radio as a sound source in "Imaginary Landscape IV" (1951), but in that piece the station numbers are dictated in the score. In contrast, KURZWELLEN directs the performer to (audibly) search the short-wave frequency spectrum and choose a station based on compositional intuition. Aesthetically, the difference is that Cage's work attempts to validate all chance sounds as being "authentic", while Stockhausen's work uses radio as a launching pad to generate timbres for transformation. The radio sounds chosen in KURZWELLEN also focus on "in between" sounds rather than the clear signals of "Imaginary Landscape IV", which makes a big difference from a musical standpoint. On a biographical note, the radio was newly invented during Stockhausen's childhood, and Michael Kurtz' Stockhausen biography reports that his mother sometimes tried talking to the voices coming from the radio. However, she became disturbed when the voices did not answer back. 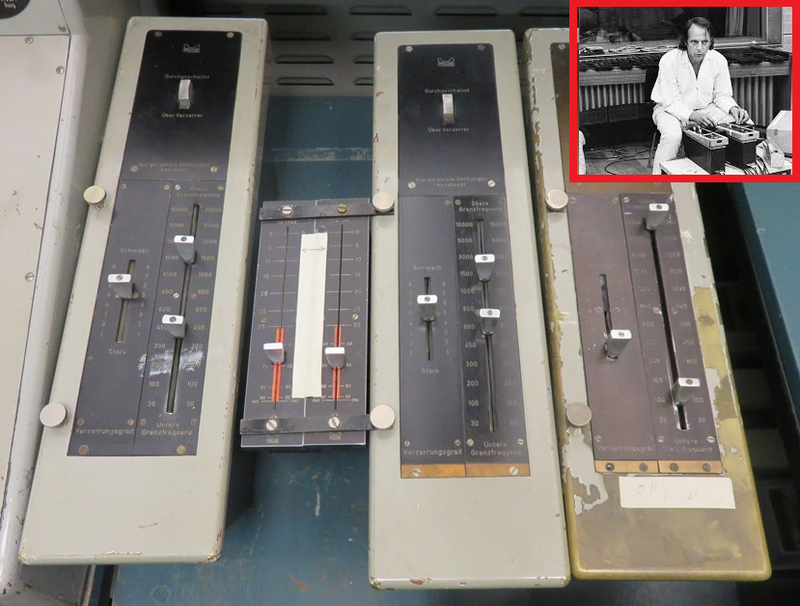 Perhaps Stockhausen's use of shortwave radio in KURZWELLEN is his way of having a "conversation" with the airwaves. The final step along this path, AUS DEN SIEBEN TAGEN, would have Stockhausen literally communicating with the vibrations of the universe. Thanks to Stockhausen Verlag for allowing usage of images from their CDs and scores. Analyses and editorial content copyright Ed Chang unless otherwise indicated. "This is your pilot speaking..."